Gartner’s annual survey of CIOs reaches out to 2,944 individuals from across 84 countries. It’s a useful barometer for the state of digital transformation, and technology support for innovation. CIOs have increasingly found themselves at the intersection between supporting the technology needs of the legacy business, and pushing change to transform the business going forward. Here's a quick look at some of the insights which standout from the survey responses. According to Gartner, Digital is intensifying, with revenues expected to more than double from digital sources in the next five years. Digital technology is helping to blur the boundaries of the traditional organizational model, which is a strain for many organizations. Those that are coping well with this increased blurring, are those who emphasize the value of connections, between customers, partners, suppliers, and employees. The technology challenge is to provide a platform where these connections can flourish: where resources can come together quickly to create value. The ability to connect such diverse and disparate resources is what counts. We see this with our clients, as innovation management programs increasingly become the platform through which multiple parties can quickly band together around a focused topic, deliver value, and disband. It's efficient, and targeted on a specific outcome. For the leading companies we work with, this process is becoming a second-nature. We see companies evoloving their use of crowdsourcing, beyond idea generation, and more towards this notion of a platform for purposeful connections. Those succeeding, are effortlessly working across silos and corporate boundaries, having worked out the IP, legal, focus and direction, and motivational barriers to do so. "Some resources may be inside, permanently owned by the company; some will be shared; and some can come from outside. The value comes largely from connecting the resources, and the network effects between them." Like we saw with Google Alphabet, Gartner believes companies are becoming bimodal - separating the exploratory parts from the existing business. Going bimodal allows companies to adopt digital technology and processes faster. 40% of CIOs are on this journey already, with the rest joining within the next three years. 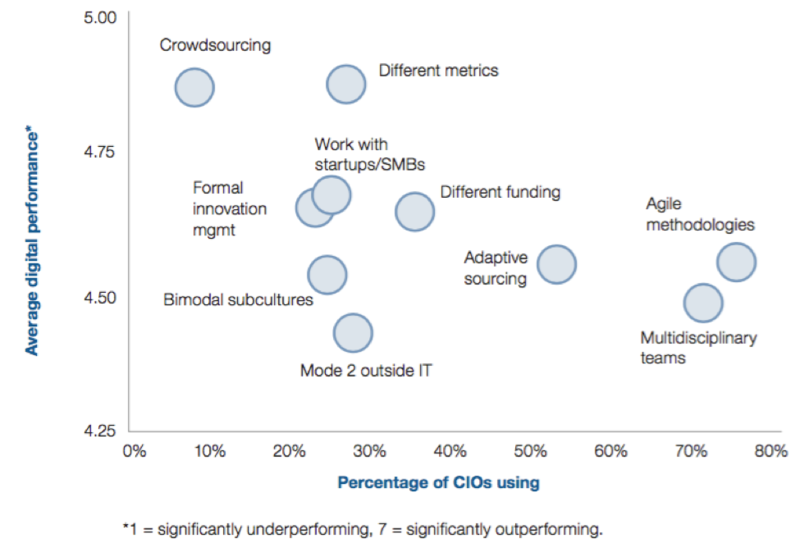 Gartner warns that delaying this bimodal transition “is one of the worst things a CIO can do”. 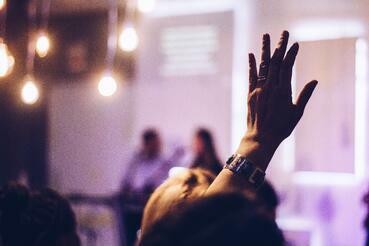 Overall, the most effective technology a CIO can adopt is Crowdsourcing, according to the survey results. However, most companies are opting for what’s easy, rather than effective. Agile and multidisciplinary teams are easier to implement and manage, and are widely adopted. Crowdsourcing and formal innovation management however, take significant consideration, but the return is far greater. We often see companies underestimate the value that can be delivered through crowdsourcing, and at the same time underestimate the effort required to deliver a sustainable and useful platform for innovation. We see the more mature organizations creating broader collaboration platforms, wrapped tightly around the corporate strategy and areas of focus, and building a full suite of methods and capabilities to support the online platform. It’s a world away from just throwing up an idea suggestion box and hoping for a breakthrough. Gartner's CIO Survey has hit upon something which has been brewing for years, namely that crowdsourcing has matured well beyond a buzzword. Organizing a large and diverse group of people - across organizational boundaries - to repeatably generate value, is a significant advantage in the digital transformation race.